In the world of financial crisis, the number of forex traders is increasing day by day only to ensure financial security in life. It’s true that if you master the art of forex trading then you can earn huge amount of money simply by trading the different financial instrument in the forex market. The number of successful traders in this industry is quite low since most of the novice trader’s jump into the world of online forex trading only to make quick money. Statistics suggest that out of every 100 trades only 5 people are making consistent profit in this industry. Those who are trading the financial instrument successfully for a long period of time have undergone many difficult stages and learning procedures. There are many different ways trading the financial instrument in the world. One of the easiest and advance ways of trading the financial instrument is by using the price action trading strategy. In this article, we will teach one simple price action trading strategy which is extremely profitable and used by many professional traders in the world. Before we get into more details lets us find out what is price action trading. Price action trading is nothing but the use of raw price data in the market and execution of a live trade by using different price action confirmation signal. There are many traders in the world who often mess up their trading chart by using too many indicators. In price action trading we will be using the naked chart and the candlestick chart pattern. Each and every single candle tells us a different story about the market and gives us a clear indication of the next move of the price. In this trading strategy, we will be using the pin bar confirmation signal to trade key support and resistance level of different currency pairs in the forex market. Let us see the graphical representation of the pin bar. In the above figure, the blue candle is known as the bullish pin bar and the red candle is considered to be the bearish pin. In a pin bar, the body will be relatively small compared to its wick or shadow. An ideal pin bar should have a wick which is at least three times longer than the body. Professional price action traders use this pin bar to trade important support and resistance level of different financial instruments in the forex market. Most of the time the price reverses its direction after the formation of pin bar at the key support or resistance level in the market. It allows the traders to execute their trade in the market will tighter stop loss .Always remember that the color of the pin bar is not important rather the place of the formation of pin bar is extremely important for the price action trader. Let’s see how the professional price action traders use the pin bar in their trading. In the above figure, the blue shaded region is the key support and resistance level of the financial instrument. Professional traders executed their long order in the market once the pin bar is formed at the key support level. When a pin bar is formed at the key support level it is considered as bullish pin bar. Price strongly rallied to the next key resistance level after the bullish price action confirmation signal. Professional traders generally set their stop loss just below the tail of the pin bar in case of long entry in the market. In general, they use 1:3 risk reward ratio or set their take profit level in the next key resistance level in the market. The second entry that the professional traders took in the chart was a sell entry. The market rejected the key resistance level in the chart and formed a nice bearish pin bar. Price sharply dropped after the formation of pin bar. Professional traders set their stop loss just above the tail of the pin bar in case of their sell entry in the market. 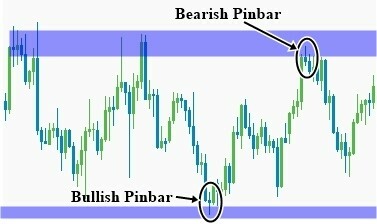 There are two ways of trading the pin bar in the forex market. The aggressive traders will take buy or sell entry in the market right after the formation of the pin bar at the key support or resistance level in the market. On the contrary, the conservative traders will wait for bullish candle after the formation of pin bar at the key support level to take their long entry. Similarly for the short entry they use bearish candlestick confirmation after the bearish pin bar in the market. Summary: Trading the currency pair with pin bar confirmation is extremely profitable in the forex market. In the eyes of trained professional pin bar trading is considered to be the simplest and profitable trading strategy in the forex market. Though reliability of pin bar trading strategy is extremely high in the forex market it’s highly imperative to use proper risk management factors. 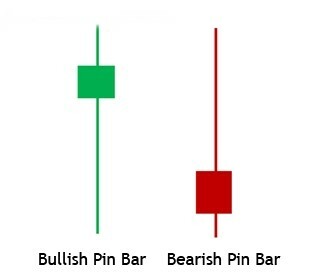 A bearish pin bar followed by bearish candle and a bullish pin bar followed by a bullish candle gives the best conservative pin bar trading setup to the professional forex traders. There are many price action traders in the forex industry who uses the trailing stop loss features in this type of trading strategy to maximize their profit. But make sure to use higher time frame chart to trade the highly reliable pin bar setup in the market. And always try to execute your trade order in favor of the long-term prevailing trend since it will reduce your risk significantly. How to Plan a Trading Week?